Gun legalization bill to be submitted to parliament in 2013 | Russian Legal Information Agency (RAPSI). MOSCOW, July 20 - RAPSI. 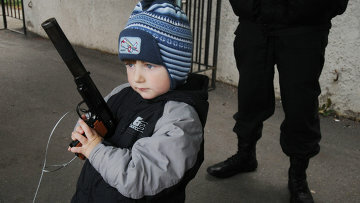 A bill to legalize short-barreled guns will be submitted to parliament in early 2013, Izvestia reports. The initiative proposed by Federation Council deputy speaker Alexander Torshin to allow individuals to keep and use short-barreled guns for self-defense may soon become a law. Senators are working to educate the public to increase their receptiveness to the initiative. An expert report will be presented by Torshin to MPs, senators, Public Chamber members and "shooting community" activists. The report will also be submitted to the presidential administration. Later, a second report - conceived as a commentary to the first - will be issued by November.The authors of the report will put forward amendments to the federal law on guns. They argue that a greater number of guns possessed legally by the population will reduce the crime rate, and propose legalizing the "my house is my fortress" concept. "We need a legal practice of automatically declaring the resident who shoots a robber trespassing on his territory a victim," Maria Butina, one of the report's authors, told Izvestia.